Tanah Lot, Bali is known as the best place to watch the scenery sunset (sunset) in Bali. Especially if you watch through the high cliffs that are also occupied by small restaurants there. The best time to visit this place is between the hours of 17:00 to 18:30 pm. 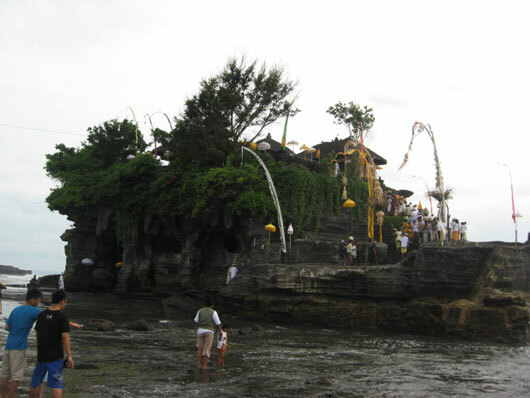 Pura Tanah Lot is one of the largest sacred temple on the island of Bali. Here are also often held ceremonies of Hindus in Bali. In addition to a very large place and the scenery is very spectacular sunset, the waves around the temple area is also the main attraction. For your domestic tourists who want to go into tourist areas will be subject to cost around Rp 20,000 per person. For foreign tourists the entry fee be doubled. Along the road from the starting gate entrance to the temple area will be found a wide range of diverse merchandise, from t-shirts, necklaces, statues and so forth until, of course, places to eat. The location to go to Tanah Lot, Bali, not far from Kuta or Denpasar. Only about 20-30 minutes away by car. Such as Kuta Beach, usually Tanah Lot is the final destination for travelers after a day visiting a variety of other interesting sights.